Well Tankers, I wanted to raise this issue and see if anyone else agrees with me and maybe even Wargaming might take it on board. I feel it is way to easy for the attacking teams to point hop after they die. Let me explain the best i can. At the start of a battle the teams are even but say the attacking team find the first few pushes hard and aren't getting far. Once they die, a heap of them can point hop leaving that flank with a greatly weaking attacking front. This is fine as it makes sense for them to be able to do that but what i see is the defending team has a full squad of alive players(usually) just sitting around with only a few to defend against and no real way to get to the other flanks to assist with that defense. Short of driving side on to the few enemy left of throwing yourself off the highest cliff(not advised due to the long wait time to get back into battle), you are left sitting around with not much to do(especially in a heavy). And yes the fronts are connected but it can take fecking ages to say get from front point A to C and by that time that point will of been swarmed and taken over. 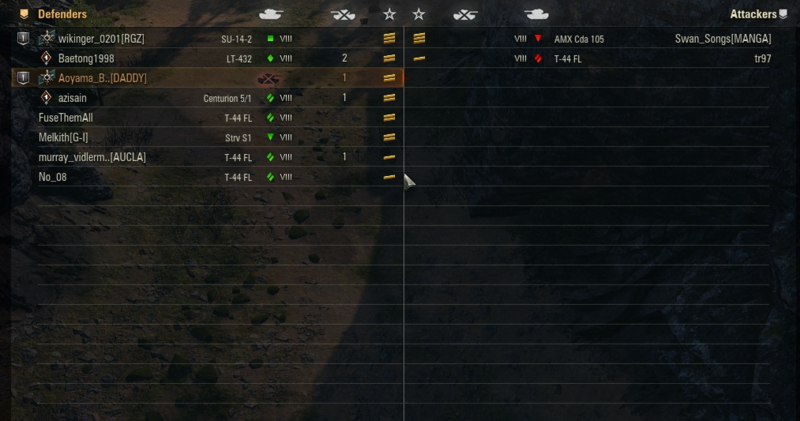 It should be capped at max of 2-3 can move flank multiple ways to address this issue, but your not wrong.. sat on defence in C cap last night in my 50tp and i think i was fighting 4 tanks on the whole front - some were obviously dead and respawning but most just bailed out to A-B flanks instead and we are stuck with 8 people in C not being able to match numbers on another flank unless we rush in and die throwing our tank away to get to the other flank.. bit hard with 5 minute wait times for respawns or reinforcements.. but oh well. Defenders have a very easy time on 2 of the caps. A defending tank has a huge advantage in general. They don't have to sit out in the open while capping. Once they are in a decent position they can just work vision while the attackers have to cross open ground and cap to keep going. One of the few advantages attackers have is the ability to change flanks. Why make it a meat-grinder so defenders get it easy? We have had this map long enough so that defenders should have a very good idea of how to make it work. If you are on a zone which is bloody easy to defend you should keep an eye on the map and maybe position yourself to be able to respond to other threats. The problem is even if you watch the map and see a threat else were you can't do anything much about it but sit and defend a point with next to no one attacking because you need to die to re-spawn or drive right across the map in some cases. I agree attackers need the chance to move flanks to break through but i think they need to fine tune how easy it is. And another point attacking is meant to be hard and it should be, right now its a piece of piss to hop and swarm a point with little or no defense to prevent you. I guess i see it that the mode should be similar difficulty for both sides. Both attackers and defenders should have easy and hard components to the gameplay. Defenders get a big advantage in that they don't have to move out of positions of strength. That is the easy part for them and allows them to farm damage when they get into a good spot. But defending should not be super easy, there should be hard parts to it. The whole point to a big map is that you can only control a small part of it and it does take time to relocate. Its a judgement call whether its better to die or take the time to drive to a new location. There is no punishment for dying in this mode so its pretty easy and fast to get to the other spawn if you need to. But it is somewhat difficult to do after playing a preserves your tank approach! Attackers get the advantage is that they can change the position of attack. That's the easy part for them. They get to concentrate force on a weak point to get moving relatively easily. Otherwise whats the fun in being fed into the meat-grinder of cap C over and over so that defenders can rack up big damage? I have mostly spawned on C when attacking. Now I pretty much ignore it and immediately move to B or quickly die and respawn in A. Or the defender on a useless front can hit J to respawn somewhere else. And you waste a life in order to do that. Edited by AlexTheKid72, 13 February 2019 - 10:56 AM. Wasting the life does not matter unless you are really short on tanks. Frontline is credit and prestige farming, pure and simple. Make the game last as long as possible, do as much damage/assist and cap/reset. Expect no team play, winning doesn't matter, just keep farming. As for losing a life, almost never an issue..... unless you are in the habit of dying 3 times inside the first 5 minutes of the game and then have to wait for the remains of the 5 minute timer count down to rejoin. To be fair there are some players that bad.... but then arguably I doubt it would be much of a loss to the team having them sit waiting to respawn.. Losing a life penalises you almost nothing..
Edited by CardinalMite, 13 February 2019 - 12:12 PM. Expect no team play, winning doesn't matter, just keep farming. I feel like your right and wrong, winning doesn't matter but a bit of team play on the attacking side goes a long way as its the only way to make the game go long enough to get to general rank, but to good team play on defence as the same result... the game wont go long enough. Plus a LT platooning makes fast capping really easy if you use smokes right and it gives insane amounts of ranking, iv mainly given up on farming damage on the attacking team and just going for caps and doing damage when I can, far more fun and not as rage inducing when you start missing shot after shot since capping is more reliable. yup, a familiar situation for me in FL is to respawn and find <6 people remaining on the map, with a massive reaming forthcoming hence.